You must check out the latest Queen and Co Shaped Shaker Kit! It is a tag shaker kit and includes 3 dies and 9 foam shapes to create 9 tag shakers! I used my shaker cards to make two totally different cards. 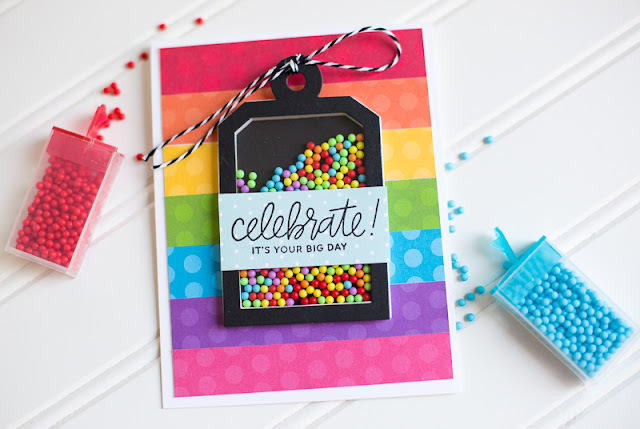 A rainbow celebratory card that was filled with rainbow Toppings and a rainbow of Dots patterned paper. I thought the round tags looked like Christmas ornaments. So I created two and hung them from twine and filled them with metallic toppings. It's never too early to start making Christmas cards! Check out this video where you can see the entire Tag Shaped Shaker kit AND how I put together these cards! Absolutely awesome shaker cards ! !